On the rise as a Hall of Fame inductee, Mike Mussina was the model of pitching consistency. 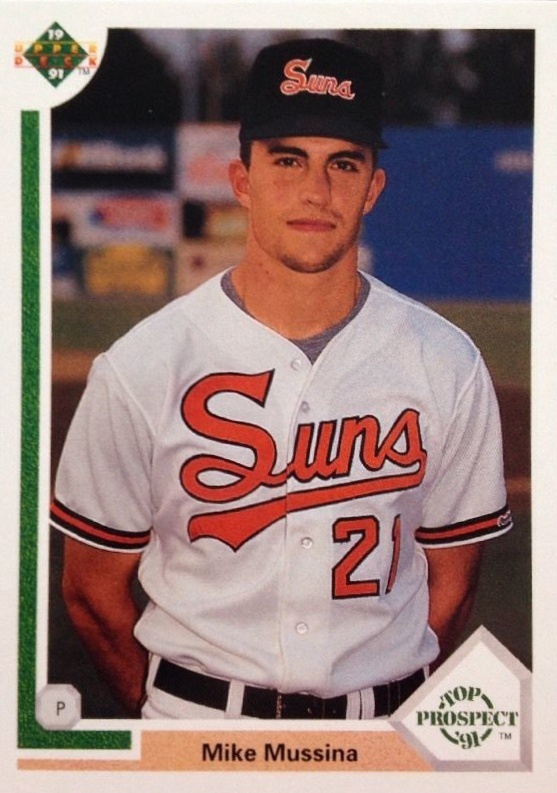 Popular with collectors of the Orioles and Yankees, Mussina's MLB cards began with 1991 products although his earliest release came in 1990 Classic Draft Picks. 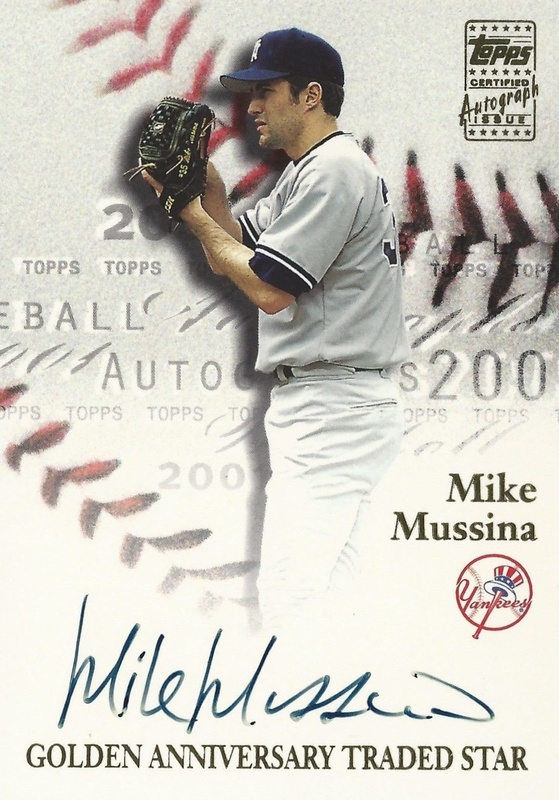 Since then, many more cards have been released but this list concentrates on some of the best Mike Mussina cards from his early years in the sport. Debuting with the Baltimore Orioles in 1991, "Moose" went 18-5 in his first full season and earned a spot on the 1992 All-Star team. 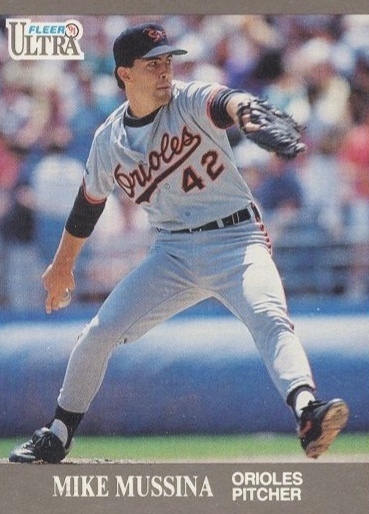 Commonly compared to Orioles legend Jim Palmer, Mussina eventually became the franchise's most successful pitcher since Palmer. In 2001, he signed with the New York Yankees, the Orioles' Eastern Division rivals, and continued to produce. Mussina was just the ninth pitcher to win more than 100 games with two different teams, notching 270 wins over his entire career. 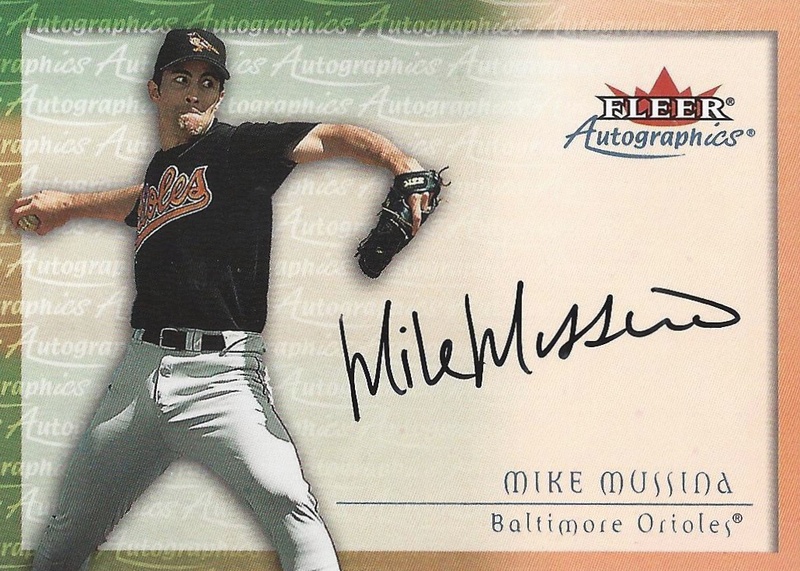 Shop for Mike Mussina autograph cards on eBay. 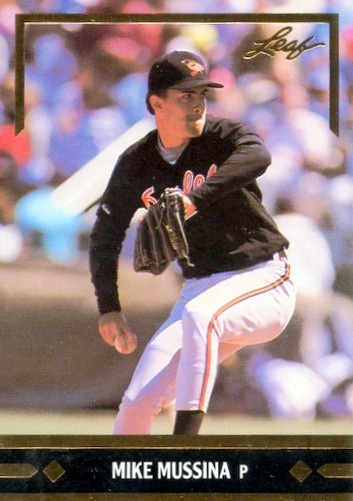 Beyond his own accolades, Mussina's career became intertwined with Orioles teammate Cal Ripken Jr. as the winning pitcher for Ripken's 2,131st consecutive game. The two were given several combination cards together, including a card in 2000 Skybox Metal Fusion and a die-cut in 1997 Upper Deck Home Town Heroes. Fans of original art cards will enjoy the pair's appearance in the 2004 Donruss Diamond Kings Team Timelines insert. In 1996 Pinnacle Zenith, Ripken and Mussina are joined by Roberto Alomar Jr. on a Mozaics insert. Because Mussina's key rookies were issued at the height of overproduction, they are available to collectors at all budget points. When building a strong collection, it is best to focus on highly-graded rookies and autographs which should see a value bump as Mussina enters Cooperstown. In formulating this, card value was considered and an emphasis was placed on Mike Mussina rookie cards and other early releases. 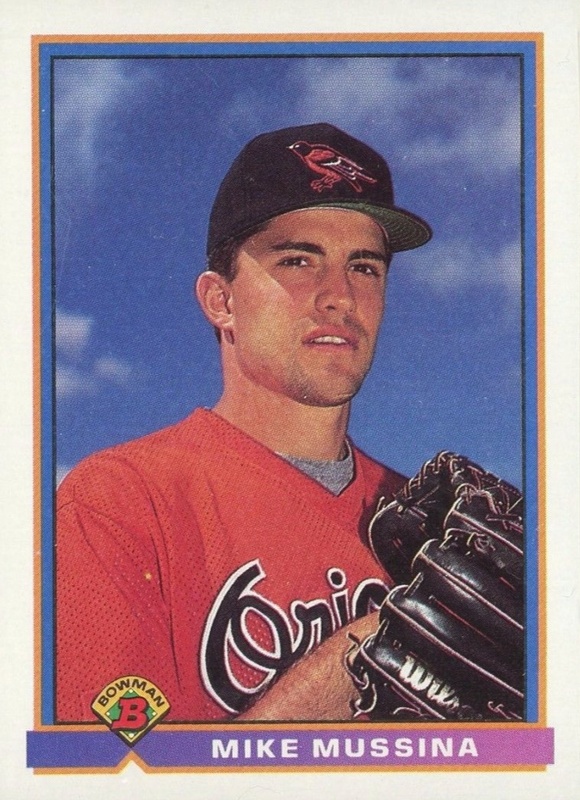 Many of Mussina's first baseball cards were issued before his debut with the Orioles in August of 1991. The 1991 Upper Deck card features Mike as a member of the Hagerstown Suns. The Suns were the Orioles AA-level farm club in Maryland. Mussina would only have three starts with the team, going 3-0 with a 1.49 ERA, before moving on to AAA with the Rochester Red Wings. 2013 Panini USA Baseball Champions highlights legends of the U.S. National Team long before they would go on to become stars in the major leagues. The signed card for Mussina is part of the Stars & Stripes insert with a main print run of 175 copies. A member of the 1986 Junior National team, he is remembered as the only pitcher to defeat the gold-winning Cuban team in the tournament that year. The U.S. team ultimately finished with a bronze medal. After he signed with the Yankees, Topps included this Mussina autograph in 2001 Topps Golden Anniversary, which celebrated the 50th anniversary of 1951 Topps Red and Blue Backs. Still going strong years later, Mussina's last season of his career in 2008 was actually his best statistically. He went 20-9 and became the first pitcher since Sandy Koufax to retire after winning 20 or more games in a season. Check out other signed cards from his Yankees days on eBay. While its spin-off, 1997 Pinnacle Totally Certified, only consists of insert cards, 1997 Pinnacle Certified has a 150-card base set. Adding to that are four parallel versions: Certified Red (found 1:5 packs), Mirror Red (1:99 packs), Mirror Blue (1:199), and Mirror Gold (1:299 packs). As you can see from the Certified Red edition below, each card comes with a protective plastic cover over the card which seems to attract fingerprints. 1995 and 1996 Select Certified are other popular 1990s options. The 1998 Donruss Crusade inserts come in three parallel versions, giving Mussina card collectors a small rainbow to build. While the pack-pulled cards are numbered, with Green (#/250), Purple (#/100) and Red (#/25) editions, collectors have found examples on the secondary market that have three X's instead of the numbering. The conventional wisdom is that those cards were prototypes/production samples for Donruss staff members who sold them on the secondary market and it is unknown exactly how many of those cards exist. The 1991 Bowman design takes a less-is-more approach with only the player name and Bowman logo on the front. Mussina's rookie is given a portrait photo, just like nearly every other player in the set. Looking slightly down at the camera, the vantage point makes him seem larger than life. 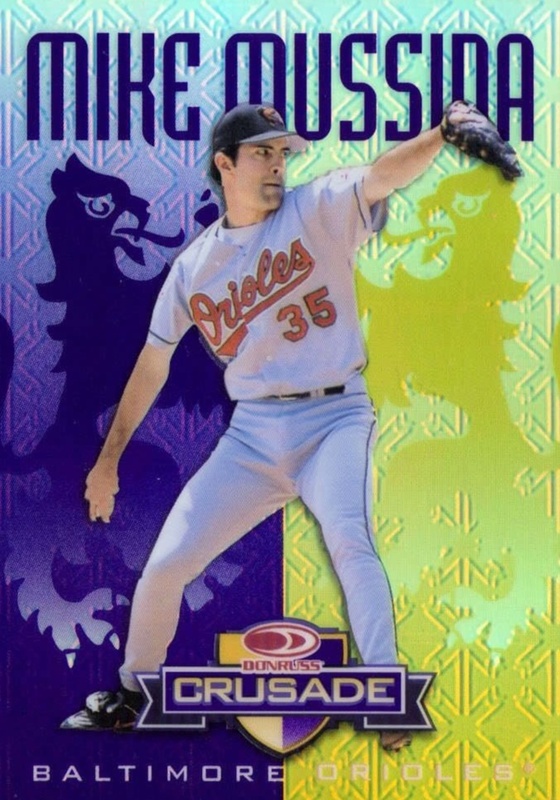 Mussina is also sporting the redesigned Orioles logo and jersey that was introduced in the 1989 season after the more cartoonish Orioles mascot was retired. 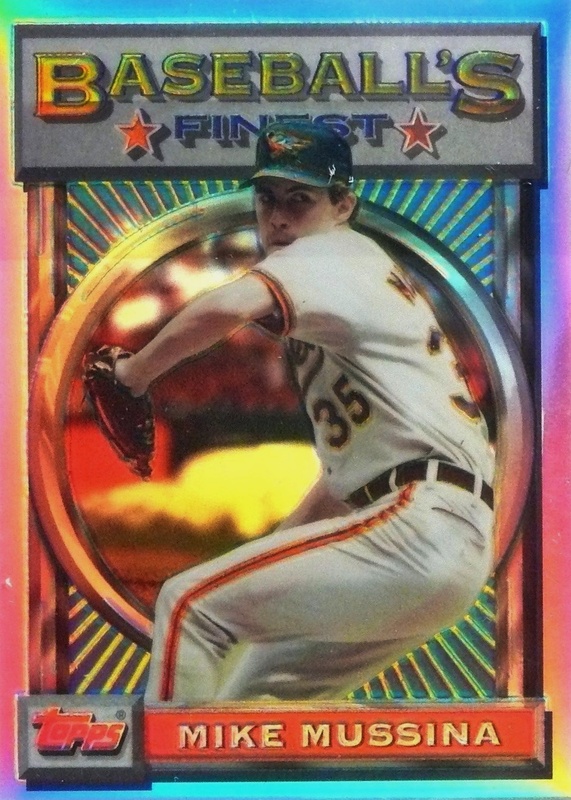 Inside the 199-card checklist for 1993 Topps Finest there is a 33-card All-Stars subset. Although Mussina was an All-Star during the '92 season, he was not part of that set. Instead, he has the standard "Baseball's Finest" design. Still, Mussina was certainly one of the finest pitchers in the league just a few seasons into his career. During his first two full seasons, Mussina had an impressive 32-11 record and he was also an excellent fielder, winning seven Gold Gloves throughout his career. In addition to 1997 and 1998 Donruss Signature, another early Mike Mussina autograph can be found in 2000 Fleer Autographics. Along with the base autograph, there are also silver and gold versions that feature serial-numbering to 250 and 50 copies respectively. 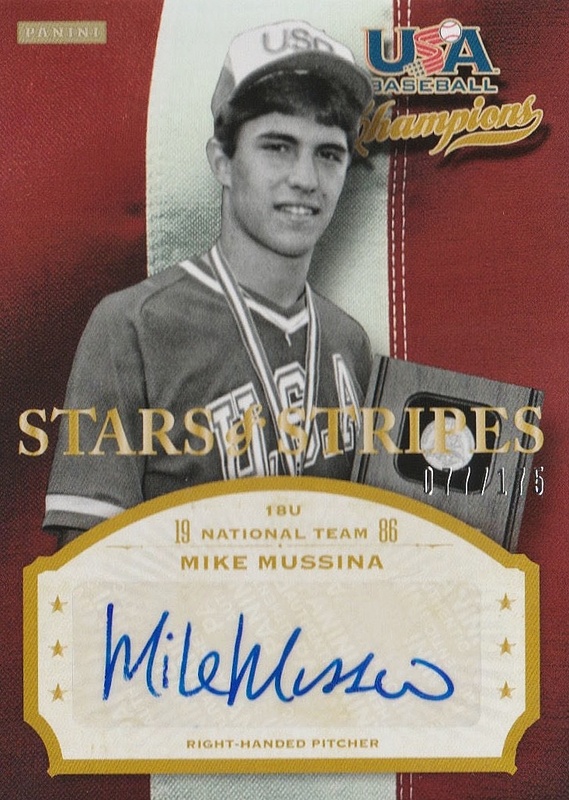 Mussina's signature is notable in that the "Mike" is frequently printed rather than done in cursive lettering and it can look more like "Mile." 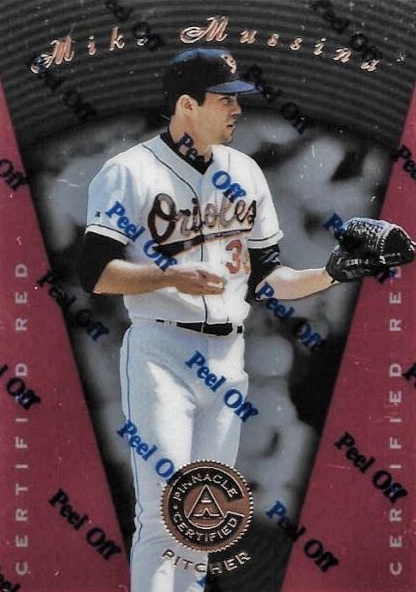 The Mike Mussina rookie card in 1991 Fleer Ultra Update is helped by the relative scarcity. Sold as a 120-card supplement to the first Fleer Ultra set, it was only available in hobby shops. Mussina is one of three key rookies included, along with Jeff Bagwell and Ivan Rodriguez. The reverse side has limited minor league statistics and features three images: a portrait photo and two photographs of Mussina's wind-up technique and follow-through. While the regular 1991 Leaf set featured cards with a silver design and black trim, the Gold Rookies insert cards were black with gold foil. These cards averaged 1:4 packs in '91 Leaf. Because the earliest cards issued in the 1991 Leaf set included Gold Leaf Rookies as part of the base numbering, a rare Mussina card with #276 instead of #BC12 can occasionally be found. 1991 Ultra Update Mike Mussina PSA 9 MINT rookie card! HOF 2019! Mike Mussina 1991 91 Ultra Update RC PSA 10 GEM MINT HOF!! !